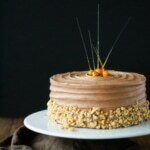 This delicious Nutella Hazelnut Cake is adorned with stunning candied hazelnuts. Preheat oven to 350F, grease and flour two 8" cake rounds and line with parchment. I use homemade cake release. Place butter and sugar into a stand mixer fitted with the paddle attachment and beat on medium until combined. Add oil and vanilla extract and beat until well combined. In a separate bowl, whisk together flour, salt, and baking powder. Turn the mixer to low and alternate adding the dry ingredients and the milk scraping the sides of the bowl as needed. About 3 additions of each. Bake for approximately 30 mins or until a cake tester comes out mostly clean. Place butter and Nutella into s stand mixer fitted with the paddle attachment. Beat on med-high until fully combined. Reduce speed to low and add icing sugar 1 cup at a time. Increase mixer speed between each addition to fully incorporate. Add cream and whip on med-high for 3-5mins. Preheat oven to 350F. Spread hazelnuts on parchment lined baking sheet. Bake for approx. 5 minutes, until fragrant. To remove skins, wrap warm hazelnuts in a dish towel and let sit for 5-10 mins. Rub vigorously in towel. Prepare as per instructions here. Note: the recipe has been converted to grams, but has not been tested in grams by me.